This is where it all started, the site of Barcelona's Cathedral and its seats of government. For all that, it's a rather calm, low-key neighbourhood, more like the centre of Paris than the businesslike centre of London. Much of it is predominantly residential; tourists and locals get along nicely on narrow streets that can be 2,000 years old. In any city founded by the Romans, you can look at a map and pick out the telltale shape of the Roman castrum, identical from Britain to the Euphrates: a rectangle bisected two ways by the main streets, the cardo and decumanus, with a forum near their intersection. In Roman Barcino, the rectangle became slightly rounded, in the loop between the curving C/ Banys Nous, C/ d’Avinyó and Vía Laietana.The gentle hill of Mons Tàber was Barcino’s 'capitol', and here the institutions of medieval Barcelona took root over the ruins of their Roman predecessors. Then in the 1870s, when the city gravitated out into the Eixample, it left behind a 14th-century time capsule; Barcelonans claim it's the most extensive Gothic city centre in the world. 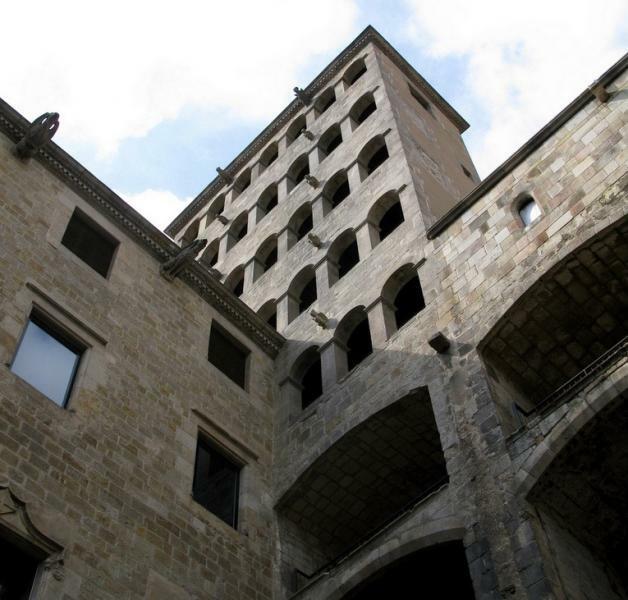 Christened the 'Barri Gòtic' in the 1920s, Barcelona’s ancient heart remains remarkably intact. On Plaça Sant Jaume, roughly the site of the Roman forum, the Ajuntament (city hall) and the Generalitat (regional government) are the two pillars of the Catalan identity. Right behind the Generalitat, the Cathedral with its wealth of medieval art and cloister full of geese occupies a spot where a great mosque once stood; there's more painting in the adjacent Museu Diocesà. Around the Cathedral are medieval palaces and churches, a unique museum of shoes, and Plaça Nova, site of the Thursday flea market. Behind the Cathedral, Plaça del Rei was another centre of power, the home of the medieval count-kings. The royal buildings on either side now house two great museums: the eccentric collections of the Museu Frederic Marès, and the Museu d'Historia de la Ciutat, with the history of Barcelona detailed in the rooms of the royal palace, and fascinating excavated remains of Roman Barcino underneath. Further south is Barcelona's first church, Sants Just i Pastor. The Barri Gotìc is bounded on the east by a modern street, Via Laietana, cut through the old quarters in 1907 as a business centre, and full of dramatic pre-Civil War commercial architecture. North of the Cathedral, the neighbourhood called the Barri Santa Anna is a prime shopping area. Here too is Santa Anna, with a lovely garden cloister, and Plaça de la Vila de Madrid, with an excavated Roman cemetery. The streets west of the Generalitat were once El Call, the Jewish ghetto, and a medieval synagogue has recently been rediscovered there. Continuing on towards the Ramblas, you'll pass Carrer de Banys Nous and its antique shops, and then a lively quarter around the Gothic church of Santa Maria del Pi. Sunday morning is an ideal time to visit. If it’s the second or fourth Sunday of the month, you can take in the tour of the Generalitat, but on any Sunday you can visit the Ajuntament and watch the Barcelonans dance the sardana in front of the Cathedral. Please don't feed the geese!